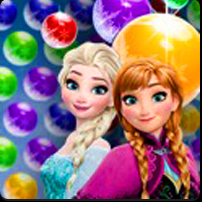 Help the beautiful character Elsa and Anna to get rid of all bubbles in this Frozen Elsa bubble shooter game. In this the lovely match 3 puzzle game, you have to aim precisely in order to shoot the bubbles to the right spot and pop some others of the same color. Aim the shooter by holding your screen and release to shoot the bubble. Can you make it to the high score in this Disney game?